In the final expansion Nuka World for Fallout 4, there are many funky and powerful weapons to find. Some present themselves here in a matching design to the theme park. Some of the weapons you can buy directly from dealers, while in others you have to put more efforts. 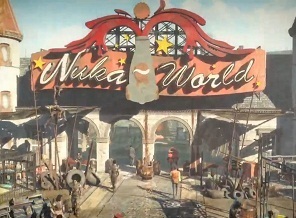 Here, we show the location of the best weapons in Nuka World. To get this weapon you have to find all hidden cappy symbols and complete the quest Cappy in a Haystack. Bonus: Fire explosive devices, which are filled with Nuka Cola. You can buy Splatter Cannon for 8,226 bottle caps. The weapon is in the Aaron Corbett’s store in the Nuka Town. It is located near the stable with the Brahmin. Bonus: Damage increases with each shot at the same target. This weapon you can find in Bradberton amphitheater. During the quest "An Ambitious Plan" you must speak with the gang leader Mason. If you have enough charisma and voice challenge, you get The Problem Solver as a gift. The weapon is one of the rewards in the Nuka Cade. Here you have to get first with prewar money tokens to buy to play, or you buy them directly from Fritsch. Every time you break the high score in one of the games, you get a couple of tickets. If you have collected 6250 tickets, go to the lobby and exchange them for an Acid Soaker. This weapon you will receive as a reward for completing the quest "Safari Adventure". In the theme park you see a half-naked battling NPC. Help him and completed his quest. Tell him in the final week that you want to share the park with your friends to get the baseball bat. Bonus: Fill the AP-Ammo with each critical hit.